5683 miles is the distance between Tel Aviv and New York. From this distance, Yael Ben-Zion (LL.M. '01, JSD '04) has been looking back at her homeland for the last ten years, considering the meaning of normal life in that charged place. In repeated visits to Israel, using medium format film camera, Ben-Zion has created nuanced and layered images that capture the texture of Israelis day-to-day life, shifting between interiors and exteriors, portraits and still life. The images focus on mundane details that carry symbolic value and invite contemplation on displacement and longing for home; they offer a poetic reflection on the way people spend their lives. The photographs are personal and intimate, but they also allude to the complex political climate in Israel and question its emotional and social consequences. The exhibition at 92nd Street Y includes 20 large-scale photographs from her book 5683 miles away and will coincide with the launch of its US release. The book is a recent nominee for the German Book Prize and one of Photo-Eye's Best Books of 2010. Ben-Zion was born in Minneapolis, MN in 1973 and raised in Israel. She is a graduate of the International Center of Photography's General Studies Program. Prior to taking up photography, Yael had a diverse legal career, which included pursuing LL.M. and J.S.D. degrees at the Yale Law School.� It was at Yale that she took her first formal photography class. 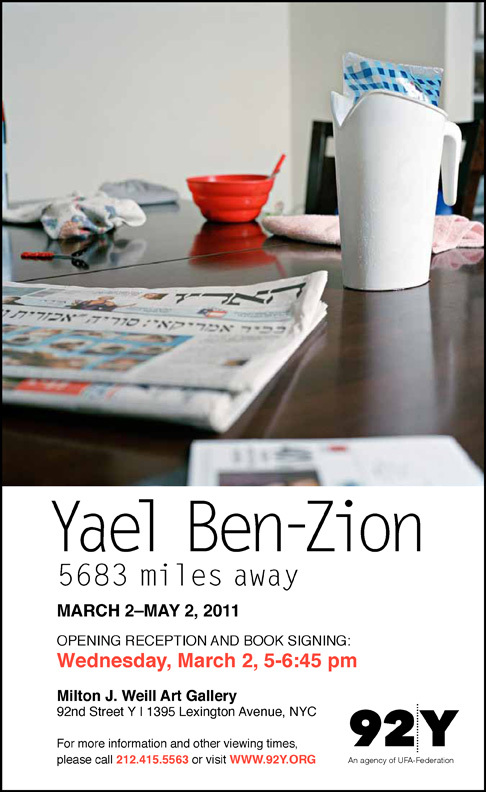 Ben-Zion's work has been exhibited in the United States and in Europe. In 2007, her photograph Crash was selected for the cover of American Photography 23. She currently lives in NYC.